When Saturday night’s lineup was first posted, Jorge Posada was batting ninth. Then, he was scratched just before game time. As various rumors about his status circulated, including speculation about a possible retirement, Brian Cashman announced to FOX cameras that Posada had asked out of the lineup. Cashman also stated that no injury was involved. Soon thereafter, a torrent of tweets suggested that the Yankees’ catcher had thrown a fit and refused to play. That news was followed by reports about the Yankees placing a call to the commissioner’s office about possible disciplinary action. Not to be outdone by the one-sided flow of information, Posada’s wife Laura tweeted that her husband was suffering from a sore back. Meanwhile, the rest of the Yankees were busy losing another game by exhibiting the same brand of impotent offense and sloppy defense that has become a hallmark over the last three weeks. 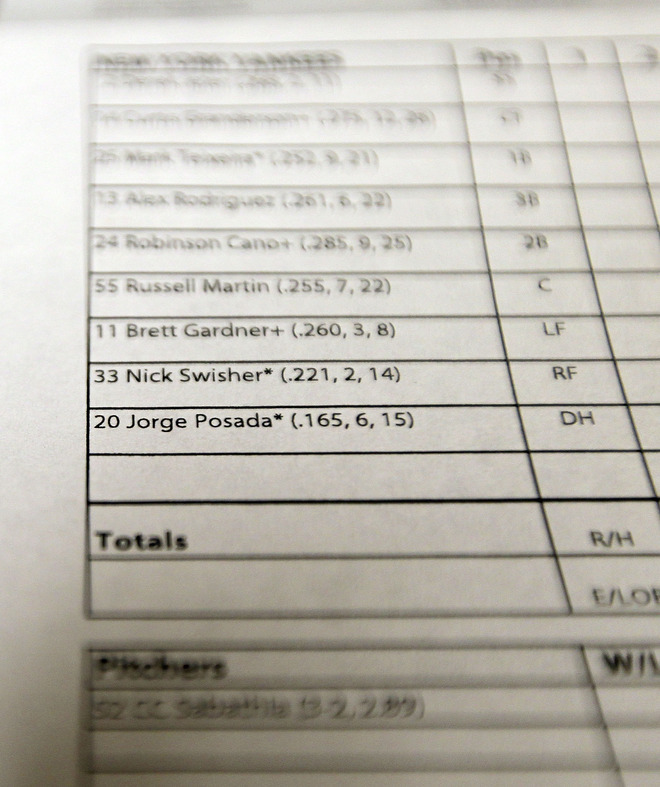 The original lineup card with Posada batting ninth (Photo: Getty Images). Before the game, the decision to drop Posada in the lineup seemed like more of historical footnote than a burgeoning soap opera. In retrospect, however, Girardi’s decision to drop Posada in such a high profile game on national television seems at least a little shortsighted. After all, what real benefit could be derived from moving Posada down from eighth to ninth? With Nick Swisher batting just as poorly, would anyone have batted an eye if he was slotted last? Considering Posada’s prideful reputation and Swisher’s happy-go-lucky personality, reversing those two players would have provided the path of least resistance. Although Girardi shares some blame for the imprudent implementation of an otherwise justifiable decision, Posada also bears some blame. His emotional reaction to the slight is perfectly understandable. For years, he has been an instrumental part of the Yankees’ success, but now he finds himself watching the sands of time fall through the hourglass. It’s a long way from starting catcher to last man in the lineup, so if Posada needed a mental day off, what’s so wrong with that? Having said that, he should have been more honest with Girardi once he decided he could not play. By failing to do so, he contributed to the chaotic course of events that ensued. It’s easy to see that both Girardi and Posada made some mistakes, but none were serious enough to warrant condemnation. Unfortunately, however, the same can not be said about that role played by Brian Cashman. For some reason, the Yankees’ general manager felt the need to go on live national television to extend the life of the story by implying that his catcher was insubordinate. Not only did the tone of Cashman’s comments leave that impression, but the follow-up reports about the Yankees seeking a fiscal remedy also served to further that implication. Had Cashman simply decided to keep quiet, the entire episode could have quickly been defused after the game. 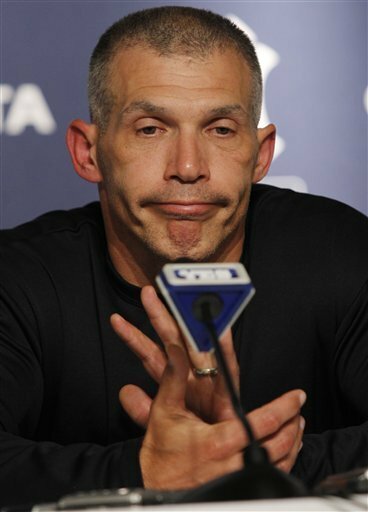 Girardi grasps for answers during the postgame press conference (Photo: AP). In the postgame, both Girardi and Posada did well in presenting their side of the issue. Girardi was empathetic with Posada’s struggles and stated that he understood his need to take a “mental day”. Meanwhile, Posada admitted that although he was thrown off by the demotion, he was not insulted by it. In most of his comments, the former catcher expressed a desire to move forward, but when asked to discuss Cashman, he expressed more than a little frustration. At one point, Posada went so far as to dismiss his general manager’s public actions by saying, “that’s the way he works now”. Apparently, Cashman still doesn’t seem to get the point. Letting Posada and his agent know you were going to air some dirty laundry isn’t exactly a good justification for doing it in the first place. As Posada alluded, Cashman has transformed himself over the past year. Once thought to be a quiet, almost secretive general manager, who was a master at saying nothing by saying a lot, Cashman is now front and center amid every controversy, freely disseminating information that probably would better left unsaid. Although this transition has been a boon for the media, it doesn’t seem as if it has gone over too well with the players. 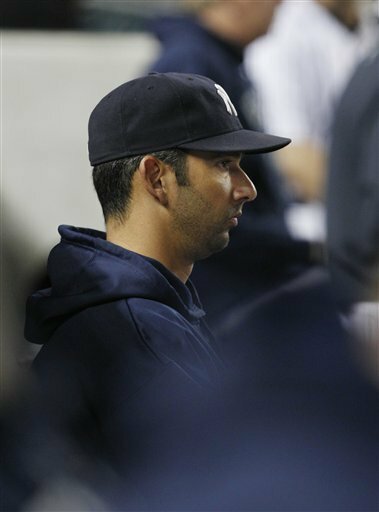 A forelorn Posada looks on from the bench during the game (Photo: AP). The first sign of Cashman’s new outspokenness occurred when the general manager challenged Derek Jeter with several pointed barbs during the shortstop’s contract renegotiations. Then, when the organization signed reliever Rafael Soriano against his best wishes, Cashman freely talked about his opposition to the move…during the introductory press conference. Off the cuff comments about Pedro Feliciano’s usage with the Mets also fanned some flames before the season, but all three of those incidents don’t compare to the embarrassment he caused the entire organization tonight. If any apology is owed by anyone, Brian Cashman should be the one to deliver it. As an admitted fan of Cashman’s overall performance as general manager, it pains me to see him continually take such a counterproductive approach. Like Posada, Cashman is playing out the string on his current contract, so maybe he also sees the writing on the wall. If that’s the case, it would be a shame if two storied Yankee careers both come to an end in such an ignominious fashion. Excellent, excellent post. It states in far more eloquent terms than I could hope to express, why Brian Cashman has to be on crack. If he isn’t, and all this throwing under the bus is actually premeditated, then my goodness, may God bless his mortal soul, ’cause his heart’s darker than the African Congo at this point. Cashman didn’t say anything out of line when he was questioned by Rosenthal. It was Rosenthal that bought up the discipline angle, and Timmy & Buck ran with it. I didn’t see the point in saying anything on FOX. Also, Cashman’s tone also implied insubordination to me, which served no purpose to do. Finally, every beat writer was tweeting about the discipline angle…Cashman had to be the source for that info. Struggling hitter’s batting 9th, and had asked out of the lineup with no known injury against a top rival. Supposedly there was a heated exchange in the clubhouse between player and manager. I’m not surprised the GM would want to comment. Besides, he said himself that Posada would address the media after the game, and that he didn’t want to speak for him. Rosenthal asked about the possibility of discipline, and Cashman said he didn’t want to comment about that. Before Cashman spoke, the only speculation was about a possible retirement. If Cashman waits, the issue wouldn’t have blown up. Nothing was gained by doing an in-game interview…all it did was increase speculation. Also, “no comment” often says more than a direct response. Going by what was posted @ Bronx Banter (tweets), it would’ve blown up. Bob Klapisch tweeted Posada & Girardi had words, I can’t imagine other reporters didn’t see nor hear anything.